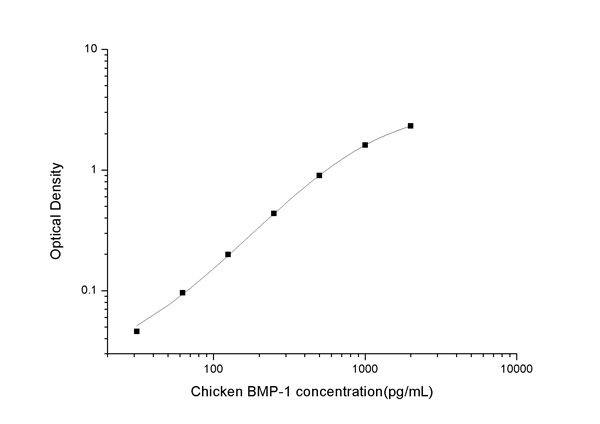 This kit recognizes natural and recombinant Chicken BMP-1. No significant cross-reactivity or interference between Chicken BMP-1 and analogues was observed. MBS2511764 is a ready-to-use microwell, strip plate ELISA (enzyme-linked immunosorbent assay) Kit for analyzing the presence of the BMP-1, ELISA Kit target analytes in biological samples. The concentration gradients of the kit standards or positive controls render a theoretical kit detection range in biological research samples containing BMP-1. The ELISA analytical biochemical technique of the MBS2511764 kit is based on BMP-1 antibody-BMP-1 antigen interactions (immunosorbency) and an HRP colorimetric detection system to detect BMP-1 antigen targets in samples. The ELISA Kit is designed to detect native, not recombinant, BMP-1. Appropriate sample types may include undiluted body fluids and/or tissue homogenates, secretions. Quality control assays assessing reproducibility identified the intra-assay CV (%) and inter-assay CV(%). Intended Uses: This ELISA kit applies to the in vitro quantitative determination of Chicken BMP-1 concentrations in serum, plasma and other biological fluids.